The OConnor O-Focus Hard Stop Handwheel is compatible with both OConnor O-Focus DM and CFF-1 follow focus systems and is designed with a transmission ratio of 1:1 for use with photo lenses (but accommodates cine lenses also). The wheel can be used to set minimum and maximum focus points for infinite rotation lenses, and to carry out hard stop pulls. It is equipped with an on/off switch that at the employ of a hand instantly disengages end stops so important adjustments can be made during sudden moments in a scene. The wheel comes with a marking disk and has an index screw that tightens to set a witness marker into a position. The wheel attaches and secures tight by lock lever onto either side of a main bridge. 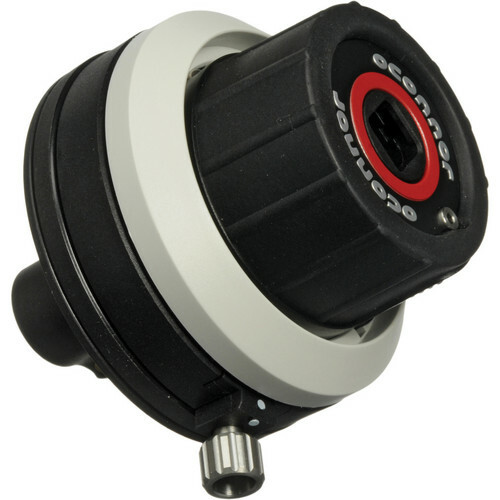 Compatible with O-Focus DM and CFF-1 systems. Features a transmission ratio of 1:1, best for still lenses. Affords min and max focus point settings and hard stop pulls. Equipped with an on/off switch that instantly disengages end stops. Box Dimensions (LxWxH) 6.0 x 5.3 x 3.6"
O-Focus Hard Stop Handwheel is rated 2.3 out of 5 by 3. Rated 2 out of 5 by Christopher from Very cheap plastic on clamping shroud I've been through two and I'm now awaiting my third from Vitec repair. The plastic shroud on the handwheel that clamps to the follow focus is an obvious weak point in the design and a huge disappointment in that it is prone to failure. The first break, I bumped into a door frame. Okay. Slightly understandable. Hard door. The second break, I bumped into the sound guy. What?! It breaks after bumping into a soft person?! For some reason - I was told that this is not a repairable part and Vitec is going to charge full price to replace the entire handwheel. This is so bogus in that they could replace this part if they wanted to but they don't. O'Connor is a tarnished brand now that they have sold out to Vitec. I'll keep using it because it's a great product, but would not recommend it because it behaves as if it's made of glass. Rated 1 out of 5 by paul from Bad design, not repairable. Like the other reviewer, my focus wheel got dropped when fitting it when the camera was on a low tripod, and cracked the weak plastic where it clamps on. I was told I had to replace the whole hand wheel. I brought this gear (along with the o-box and o-grips) with an idea that it was professional equipment that would be strong and repairable. The wheel when it was working also seemed unbalanced, like the wheel was pressed incorrectly in manufacture. Best to stick with brands with a history of making this stuff, i.e., arri. Rated 4 out of 5 by Devon, filmmaker from Great quality. Flimsy. Maybe overpriced for how flimsy it is. Someone dropped one from their hand on set and the gear cracked, hence my having to buy a new one. I mean seriously, it really wasn't a hard fall. An iPhone could have survived it. That said, it is a very high quality handwheel. Does the job.